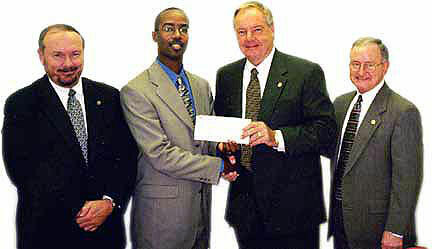 Roland Hendricks, global reporting specialist for Dow Chemical, presents a check to R. Dean Lewis, COBA dean, and Bobby K. Marks, SHSU president, for the development of the Dow Technology Demonstraton Center in the College of Business Administration. Ross Quarles, left, professor of accounting, designed the center. A new kind of electronic classroom especially designed for teaching computer software applications is in the works at Sam Houston State University's College of Business Administration. The high-tech classroom, made possible by a $160,000 grant from The Dow Chemical Company, will help SHSU keep pace with the rapidly changing technological needs of the professional world. Utilizing state-of-the-art instructional aids, the new "Dow Technology Demonstration Center at SHSU" will facilitate student mastery of the latest industry-preferred software, as well as other critical computer-aided business skills like database research and multimedia development. "Software skills are a real key to student competency," explained Ross Quarles, the SHSU accounting professor who designed the center. "Students will need these skills to compete in the business world of the next century." Because the center will be wired for teleconferencing and remote interactive broadcasts, it will also play an integral role in SHSU's distance learning initiatives. "We are very excited about the many extraordinary educational opportunities the Dow Technology Demonstration Center will afford students at Sam Houston State," said R. Dean Lewis, dean of SHSU's College of Business Administration. "We are also extremely grateful for the generous support of our friends at The Dow Chemical Company, and for their commitment to the advancement of SHSU programs." Dow's long-standing relationship with SHSU has been repeatedly expressed in gifts, scholarships, and through the recruitment of SHSU graduates. "We are very pleased to have this opportunity to partner with Sam Houston in this effort to further advance technologically the educational process in this rapidly changing and competitive environment," said Arnold A. Allemang, Dow's vice president of global operations and himself an SHSU graduate. "This partnership effort further allows us to build on the strong personal and professional relationship we've enjoyed with SHSU for many years." Today, a number of SHSU graduates occupy key leadership roles within The Dow Chemical Company. "Sponsorship of this project received broad and enthusiastic support from the many SHSU alumni currently working at Dow," said Preston Johnson, Jr., Dow's global director of human resources and also an alumnus of SHSU. "This effort allows us to say thanks to SHSU for the excellent education given to us and in a small way helps to shape the preparation of future SHSU alumni." Roland K. Hendricks, a Dow global reporting specialist, is another SHSU alumnus who played an integral role in arranging the corporate grant for the new facility. He envisions the Dow center as a classroom "where students will be able to better develop their analytical skills and participate in the development of business solutions." Unlike traditional computer labs, designed with an emphasis on production and packed with as many work stations as possible, the Dow Technology Demonstration Center is being uniquely designed to accommodate instruction. Initial plans call for the installation of 16 computer work stations, each to be shared by two students. The computers will be linked to an independent network server programmed especially for the demonstration center. "A critical element of the center's configuration is the capacity to display images from the center's server or from any work station in the center to all of the remaining work stations," Quarles explained. "This will allow the instructor to demonstrate tasks on each student's monitor or to display the work being done by one student on all other monitors in that room." A large, centralized projection screen will also be utilized to augment classroom demonstrations. "The design," Quarles said, "will not only allow the instructor to directly interact with students on a one-on-one basis, but will also allow students to interact with one another." By requiring students to work in two-person teams, Quarles said, the layout encourages interpersonal communication and activity skills. "This team concept," he added, "also takes advantage of the fact that, in the area of computer technology, students often learn more readily from one another than from the instructor who gives them their grade." The demonstration center's computers will be arranged in a horseshoe configuration facing three walls of the facility. Instructors will be stationed at the head of the classroom where they can access the various controls to orchestrate their multimedia presentations. A large conference table at the center or the room, equipped with the latest conferencing aids, will enhance the center's professional environment. Between computer sessions, students will gather around the table to discuss their findings and defend their work. "Students," Quarles said, "will be able to employ the center's technology in a conference-room setting to technologically enhance their discussions, illustrate their points, and present their evidence in a real time environment." Ultimately, plans call for the facility to be wired with video cameras, microphones, and other hardware needed to facilitate the broadcast of interactive classroom presentations to remote locations, such as the University Center in The Woodlands where several SHSU classes are taught. These same "distance learning" technologies will also allow SHSU students to engage in teleconferences with industry professionals on course-related topics. For example, a business class could receive a ten-minute briefing on a cost accounting problem from a division controller at Dow. Students could then be asked to devise a solution to the problem to be presented at a future teleconferencing link. "Assignments like this," Quarles said, "allow students to address 'real world' business problems while interacting with professionals in a corporate environment." The Dow Technology Demonstration Center will be located in SHSU's Smith-Hutson Business Building, in the room currently used as an accounting lab. Quarles said construction on the project could start as early as the spring 1999 semester, and pilot classes may be available later that same year.